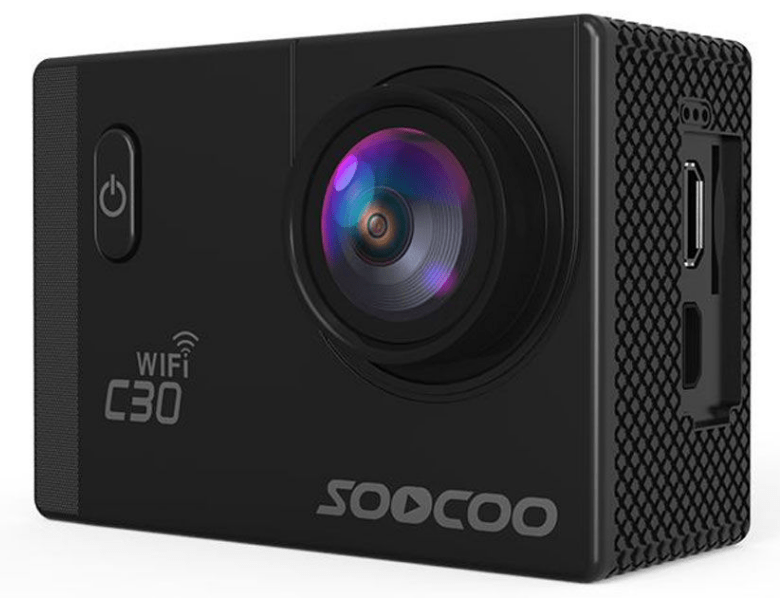 The SOOCOO C30 is a 4K video capable action camera that is sleek in design and boasts of a Novatek 96660 chipset, 170-degree wide-angle lens and a CMOS image sensor with a focus range of 12cm to infinity. 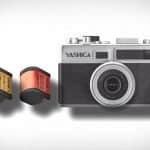 This 4K action camera is able to shoot still photos up to 20 MP and has a diving mode, among its several interesting features. Inexpensive and easy-to-use, the SOOCOO C30 also has four different view angles. It also comes with a gyro stabilizer that helps in minimizing vibrations and shakes when capturing videos while in motion. 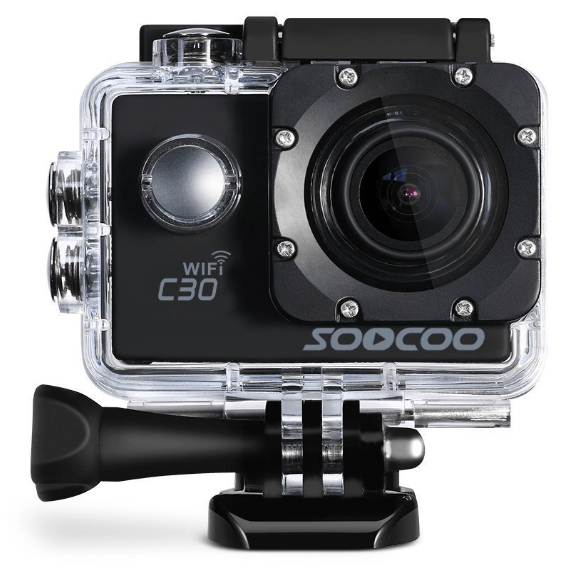 The C30 4K action camera from SOOCOO is designed with a box-type body that is water proof is up to 30 meters or 98 feet. 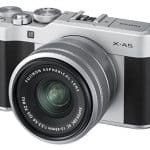 It is also equipped with a back-illuminated 12 MP CMOS image sensor from Sony that also boasts of 12cm to infinity focus range as well as a wide-angle lens at 170-degree. The gyro stabilizer feature ensures that there is reduced if not total absence of shaky videos. This action camera also has motion sensors that it can automatically operate and capture videos with gravity or when motion is detected. Aside from this, this camera is capable of loop recording as well a voice prompts. This prompt allows for stopping and starting video recording and notifies the user if battery is low as well as memory. 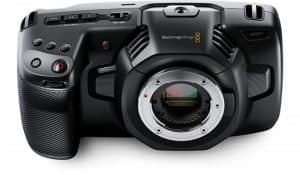 In terms of capturing footages, this camera can record 4K videos at 24 frames per second, 2K at 30 frames per second, 1080 at 60 frames per second and 720p at 120 frames per second. 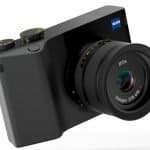 Equipped with a Novatek 96660 chipset, this camera also has a diving mode feature that is perfect for use underwater. 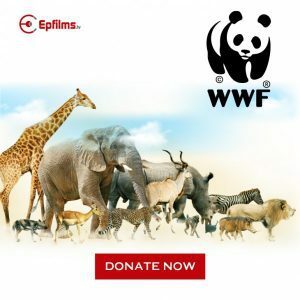 This feature has Red light compensation mode that is responsible for creating great color reproduction for videos taken underwater. 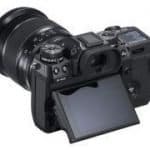 As for display, the LCD is 2” in size which is ample enough to configure the camera settings as well as monitor still photos and videos taken. The lens, on the other hand, is adjustable from 70 to 170 degrees. As for the video format, this action camera comes with several. These are 4K at 24 fps or 2880 x 2160, 2K at 30 fps or 2560 x 1440, 1080p at 60 fps or 1920 x 1080, 720p at 120 fps or 1280 x 720 and VGA at 240 fps or 640 x 480. It can also take still photos of up 20MP. The C30 4K dash camera has self-timer and burst mode options. 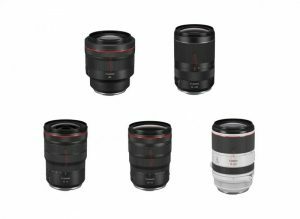 Customizations can also be done manually, such as exposure adjustment and ISO. For storing images and footages, there is a slot for a microSD card. Another interesting feature of this action camera is WiFi connectivity with a range that is up to 15 meters. This built-in WiFi connectivity allows the user to connect the device to other mobile devices and operate it remotely. Other connections are in Micro USB and mini HDMI while power is supplied by 3.7 1050mAh battery. 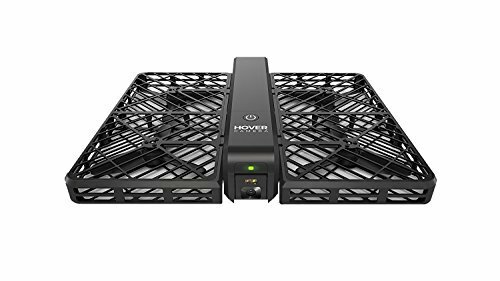 Other features include storage on MicroSD and can accommodate up to 64GB and the Li-ion battery included in the package can last up to 70 minutes of recording time, in this case, there are two battery packs that doubles recording time while charging time is three-and-a-half hours. In terms of shooting mode, on the other hand, self-timer options are available in 2s, 5s, 10s and double loop. In the package, accessories such as adhesives, mounts, wiper, waterproof case, protective door, base, bicycle bracket, adapter and other pertinent parts are included. 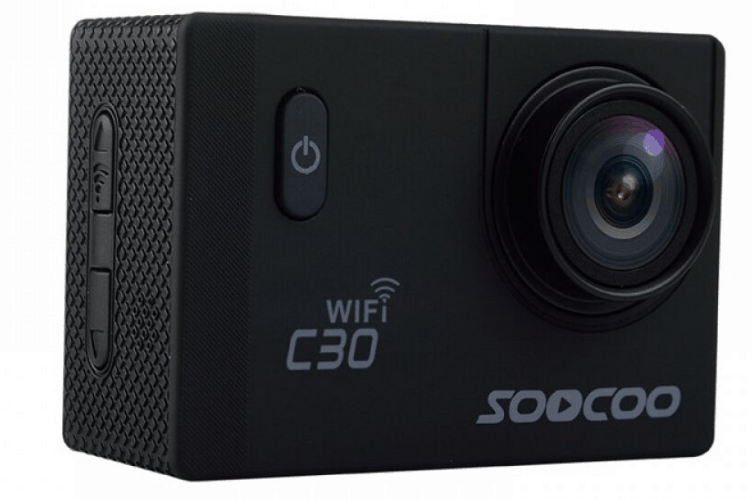 The SOOCOO C30 4K action camera has several interesting features that make it appealing to potential owners. It comes with an affordable price yet its performance is not far behind more expensive brands. This 4K dash cam also comes with several mounts in the package that makes it ready-to-use right away. 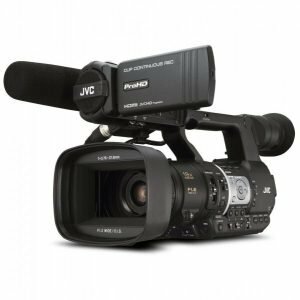 With its price, being capable of 4K video recording is a big plus. 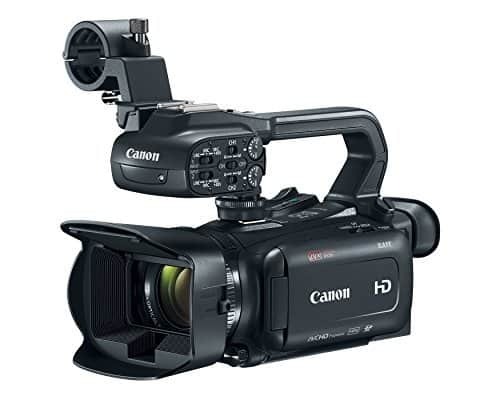 Other appealing features of the C30 is its waterproof and sturdy body as well as the Red light compensation mode that brings out the rich color in underwater videos. Also, the WiFi connectivity feature allows the user to operate the device remotely, making it hands free. There are also some flaws attributed to the SOOCOO C30. Given its price, the mounts are not that robust-looking. With the WDR on in direct sunlight, there are white balance issues that are noticeable. Also, when the device is enclosed inside the waterproof case, voice prompt can be inaudible. Overall, the SOOCOO C30 4K Action Camera is a good buy because it is affordable but it performs as promised. 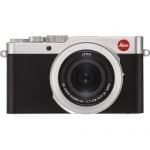 This camera is perfect for people who are looking for an action camera that is easy on the budget but easy-to-use and takes quality videos and photo stills.